Biogas is created by anaerobic fermentation (excluding oxygen) from silage or biogenic waste. We process maize silage, whole plant silage, slurry, manure and organic waste in our plants. Biogas is used as a fuel in our combined heat and power units (CHP) for the highly efficient generation of electricity and heat. The energy generation is largely CO2-neutral, because the amount of carbon dioxide that can be released during the energetic use of biogas cannot exceed what the plants had previously absorbed during their growth stage. The use of renewable resources reduces the dependence on fossil fuels like oil and natural gas and contributes to the strengthening of local agriculture and small and mid-sized industry. We replace up to 80% of the energy sources in our heat generation plants with renewable fuels. And with the recirculation of the organic residues from fermentation into agriculture the resource cycle is closed and the process has the added benefit of reducing the need for mineral/chemical fertilizers. The electricity generated is fed into the local power grid. The district heat will be forwarded to our heat supply regions. 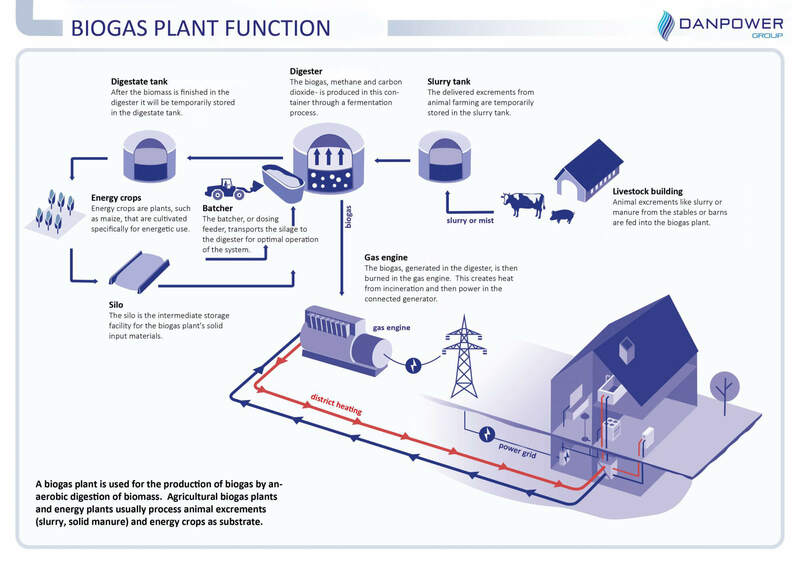 But biogas can also be processed into biomethane and fed into the natural gas network to be used in highly efficient cogeneration plants independent of the time and place of the biogas production. The treatment process includes desulfurization, drying, CO2 separation and final cleaning processes. Take a look at our info graphics below or learn more about our biogas plants.